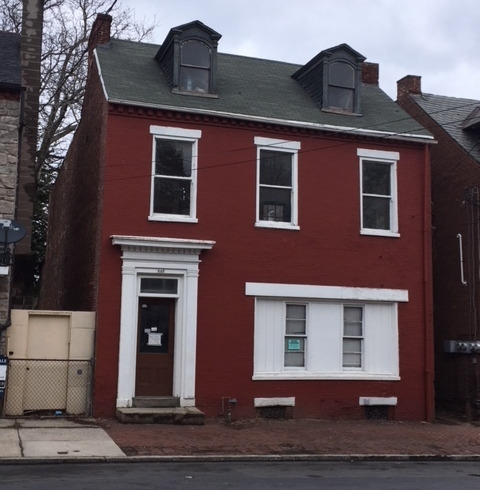 This will be a real estate only sale on a 5-unit apartment house in Lancaster city. First floor consists of two 1-bedroom apartments & one 2-bedroom apartment. Each apartment has its own kitchen, bathroom, & living room. The second floor has two 1-bedroom apartments. The one apartment upstairs has a big kitchen area, bathroom, & living room. The other apartment is a kitchen/living room combo & bathroom. Currently they are getting $495-$595 a month for rent per unit. There are 2 vacant units. Other features include full attic for storage, basement, gas heat, all brick house, & off-street parking in the back that is rented out for $25 a month for each parking spot. This is a great investment opportunity! Call 717-286-8282 to schedule a walk through of the property. 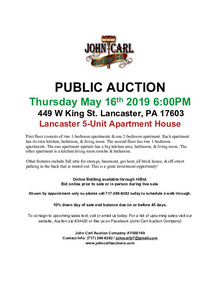 Download "May 16th Lanc 5-Unit Apt House.pdf"